Brock Osweiler won't be starting at quarterback for the Browns-at least not in Week 1. 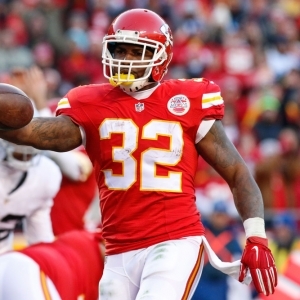 Spencer Ware won't be running the football for the Chiefs-not at all this season. The perils of the preseason are hitting people hard right now, either via the loss of jobs or injuries that are always inevitable. Meanwhile, the Red Sox have been unable to pull away from their division rivals, and the FedEx Cup Playoffs got off to a rough start for Jordan Spieth. Brock Osweiler . Osweiler is still going to get paid because he signed a big contract in 2016, but he is not going to be playing in Cleveland any time soon. Head coach Hue Jackson has named DeShone Kizer his team's Week 1 starter. "He's earned the right to play through his preparation," Jackson explained. "He's established a work ethic that has earned the respect of his teammates." Jackson also assured that this decision is not simply "for the moment" but that the Browns are going to "ride him through it all." In turn, they are now exploring trade options for Osweiler. Cleveland is a +9 home underdog against Pittsburgh in Week 1. Spencer Ware . The Chiefs' running back suffered a torn PCL in last Friday's preseason game against Seattle and is expected to miss the entire 2017 campaign. Ware led Kansas City with 921 rushing yards last year. "Spencer was so good at everything," quarterback Alex Smith said. "Especially for a bigger guy, he could kind of do everything…. That's a guy that put a lot of time in-a lot of reps doing all of those things for our offense. He'll definitely be tough to replace.'' Kansas City is a +215 second choice to win the AFC West. Raekwon Davis . Alabama head coach Nick Saban was not a fan of the recent eclipse. He is surely even less of a fan of one his best players getting shot in the leg by a stray bullet. That's what happened to Davis early Sunday morning outside of a Tuscaloosa bar, and he was taken to a local hospital for what was called a minor injury. It is not known if the sophomore, who is projected to start at defensive tackle, will be available for the Crimson Tide's season opener. Alabama is a -7 favorite to beat Florida State at Mercedes-Benz Stadium in Atlanta on Saturday. Boston Red Sox . The Red Sox enjoyed a more comfortable lead atop the American League East standings a week ago, but the advantage has dwindled to 2.5 games over the rival Yankees. Boston is in the midst of a four-game losing streak, having dropped its finale against Cleveland last week before getting swept by Baltimore. The Orioles, though, still need to do much more to get themselves in the mix (currently eight games back). A grand total of four runs were scored by the Red Sox in their series against Baltimore. Boston is +260 to win the AL Pennant, right behind Houston (+240) and Cleveland (+250). Arsenal .The Gunners were nothing short of abysmal on Sunday in a 4-0 English Premier League loss to Liverpool. They gave up goals in the 17th , 40th, 57th, and 77th minutes to Roberto Firmino, Sadio Mane, Mohamed Salah, and Daniel Sturridge of the Reds. "Blame us, shout at us, criticize us, but I'm also very disappointed about today's game," midfielder Mesut Ozil posted on Instagram. "…We were simply not good enough during the 90 minutes and Liverpool deserved the win without a doubt…. Gunners, I'm sorry - especially for the fans who travelled all the way up to Liverpool to see us fighting." Arsenal is 1-2-0 through three matches and tied for 14th place on the Premier League table.Manchester City is a +140 favorite to win the EPL title; Liverpool is +1000. Jordan Spieth . Spieth almost blew a four-shot lead at the British Open. He did blow a five-shot lead at The Northern Trust on Sunday. Spieth eventually recovered at Royal Birkdale to hold off Matt Kuchar, but this time the 24-year-old American played par golf down the stretch and Dustin Johnson was too clutch at the FedEx Cup Playoff's first event. Johnson put himself tied atop the leaderboard with a birdie on the par-3 15th and he remained there with a must-make 17-foot putt on 18 that curled around the hole and in. The 33-year-old promptly birdied the first extra hole to win, sticking the dagger in Spieth with an approach shot to four feet. Andy Murray . Last year was Murray's best ever as he finished a season No. 1 in the world for the first time in his career. The 2017 campaign, however, has brought the Scot crashing back to Earth. It has been an especially rough past few months as Murray has been sidelined by a hip injury since losing in the Wimbledon quarterfinals to Sam Querrey. He also lost his No. 1 ranking, which he had held for 41 weeks before Rafael Nadal took over earlier this month. The three-time Grand Slam champion may have hit a low point over the weekend, when he was in New York hoping to play the U.S. Open only to announce that he had to withdraw. With Murray, Novak Djokovic, Stan Wawrinka, Kei Nishikori, and Milos Raonic all out, Roger Federer is a +175 U.S. Open favorite.